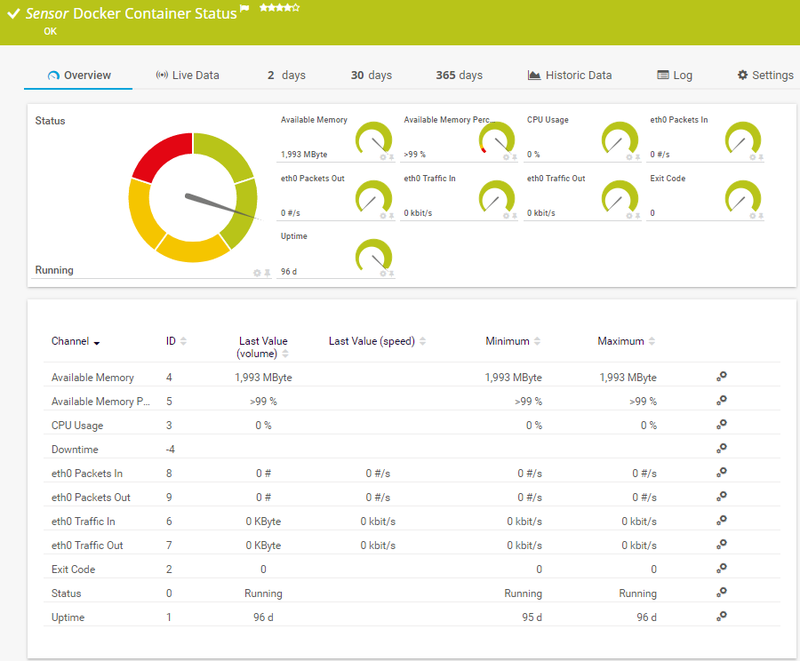 Select which Docker containers you want to monitor. PRTG creates one sensor for each container you choose in the Add Sensor dialog. The settings you choose in this dialog are valid for all of the sensors that are created. Select the containers you want to add a sensor for. You see a list with the names of all items which are available to monitor. Select the desired items by adding check marks in front of the respective lines. PRTG creates one sensor for each selection. You can also select and deselect all items by using the check box in the table head. Provide the private key for the connection to Docker. If you have already created a key, you can use it here. Otherwise, please create a certificate on Docker first. See section More for a link to the Knowledge Base article about how to create a Docker certificate. Provide the certificate for the connection to Docker. If you have already created a certificate, you can use it here. Otherwise, please create a certificate on Docker first. See section More for a link to the Knowledge Base article about how to create a Docker certificate.